Hera = Queen of the gods, and that she is! Hera is a Rigid with a 30 degree rake. 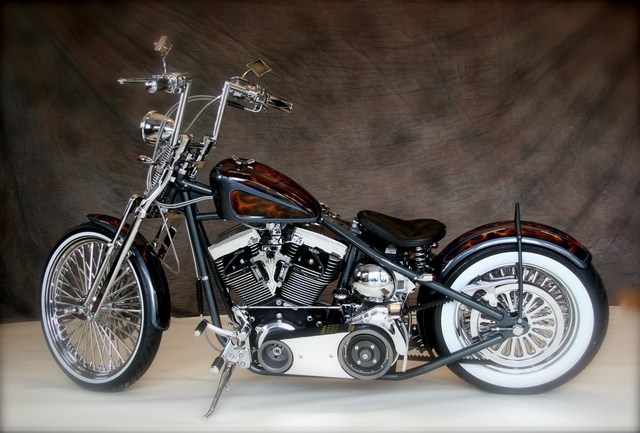 She has white wall tires and mammoth spokes, colored or chrome wheels, rounded fenders, custom handmade sissy bar, small indented gas tank, 10” rise z-bars, 110” RevTech engine, 3” BDL belt drive, a 6 speed transmission, a nice spring solo seat, electronic gauges, and much more. We sell Hera at a set price, unlike many bike builders who offer a low base price for a very simple motorcycle, and then charge for every little item. We believe in offering the best right up front and in giving you some say in the building of your own bike at no extra cost! Price: $27,000.